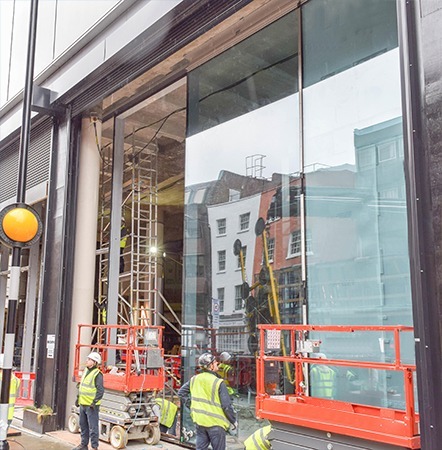 Lifting into place very large glass panels when constrained by having to work in confined areas on busy urban streets is a challenge – which is why speed, precision, and safety are so important. 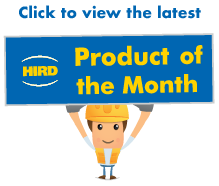 That is why glass installation specialists are turning to Hird to make use of our Hydraulica 3500 super heavy vacuum glass lifter – capable of lifting panels weighing up to 3.5 tonnes. The capability of the machine, known as Brutus, was made clear by a recent project in Grays Inn Road in the centre of London. The Hydraulica 3500 was used to install eight panels, each seven metres high and three metres wide. 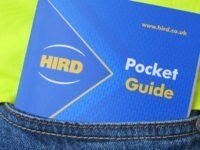 Hird Director John Wilding, in charge of the company’s Southern Operational Hub at Redhill, Surrey, said: “Working closely to live environments in congested urban areas present big challenges for curtain wall and glazing installers. “Where, like this, the installation has to take place on a busy street, there is every incentive to find a glass lifting solution that ensures the lifting team spends as little time as possible carrying out the task. “It means less time for traffic management to be in place, which minimises cost, less time for the public to be inconvenienced and a faster turnaround for making the building secure. 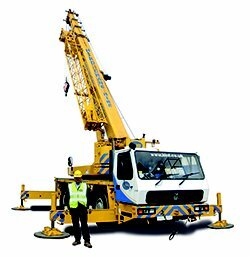 “That’s where vacuum lifters like the Hydraulica 3500 Brutus comes into its own. With this lifter, panels can be picked up and moved swiftly into place with a relatively small team of installers. 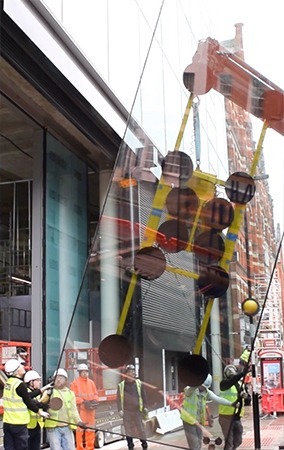 “With its 90-degree hydraulic tilt and 210-degree lockable rotation, a panel even as big as the one being installed in Grays Inn Road can be manipulated with precision, speeding up the installation process. 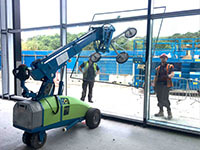 The Brutus vacuum lifter, manufactured by Kappel, with design support provided by Hird, has extendable arms for lifting large or irregular loads, and excellent safety features, as you would expect from such a large glass lifter. 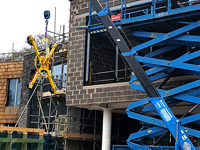 For more information about glass vacuum lifter hire from Hird, as well as spider crane hire and pick and carry crane hire to support glass installation, call Hird today. Vacuum lifter operator training is also available.